By the time Mike Starcevic headed to work this afternoon, Bryn Mawr Avenue on the city’s North Side was slick but mostly snow free. A good thing since Starcevic has to commute on a bike. 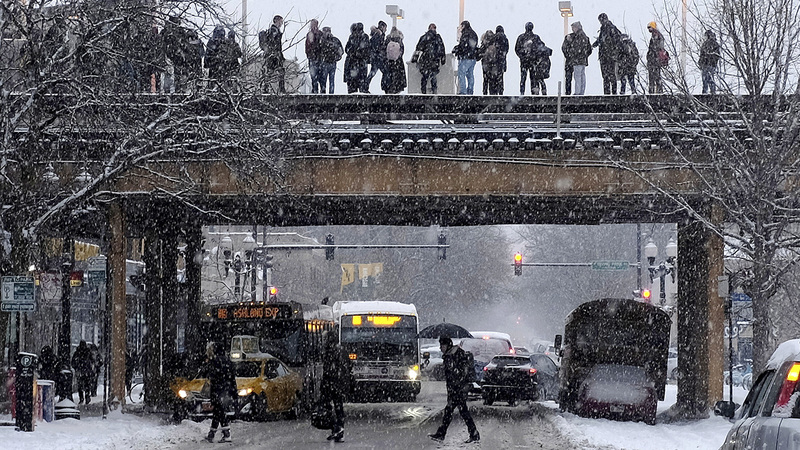 At O’Hare International Airport, where official snowfall is measured, only a little over 4 inches of snow had accumulated by midday on Monday. That was on the lower end of snow totals in the area, with some places getting upwards of 7 inches. But while nowhere near a record, the snowstorm was strong enough to force the cancellation of more than 1,000 flights at O’Hare and Midway. The greater concern among city officials are the polar temperatures predicted to arrive in the area starting Tuesday. With a forecast low on Wednesday of around minus 20 and wind chills that could make it feel more than twice that cold, the city says it’s expanding warming shelter hours for residents who might need a warm place to stay. “Our city-funded shelters will stay open 24 hours so that residents do not need to leave the facility during the day,” said Lisa Morrison Butler, commissioner of the Department of Family and Support Services. More: Find warming centers in Chicago. Chicago Public Schools were open Monday but CPS says it will make a decision by midday Tuesday about whether to close on Wednesday when the dangerous arctic blast is expected to arrive. “Student safety is a top priority for our district, said CPS CEO Janice Jackson. “And while cancellations can be disruptive, we will not hesitate to cancel classes if we think we are unable to safely receive students.” The schools chief says parents will be notified of school closures via email, robocalls and social media. Until now, the winter of 2018-19 seemed to be progressing unexceptionally. But by midweek, it could be one for the record books.